Cooling Solutions for Summer Events ! Event Equipment Rental in Delhi ! As summer is coming so you must take care of Cooling Solutions for your event. And the more noteworthy thing is to be aware of bellow Items before hiring because the event is not possible without these accessories. If you are planning or managing an outdoor event according to Delhi temperature best solution is AC tent which can be any size. We are the market leader is providing AC tentage along with all solution. Hanger is the best solution for corporate events, social and political events. It can be decorated as per theme and safe and secure. The main thing is it can install in any possible size.We provide fireproof German hanger on rent any location. Pagoda is best for food stalls, Green rooms, meeting rooms, lounges etc. You can put an AC for controlling temperature. AC is available in different type like Window, Split, Portable, Tower, Centralised etc. AC is available in different capacities like 1 ton,1.5 ton, 2 ton, 8 ton, and any bigger size. 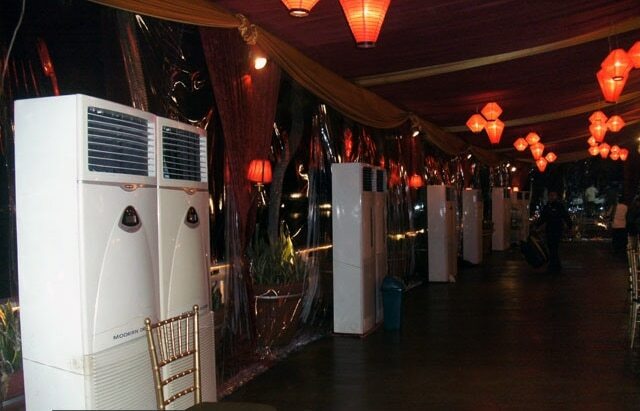 Hire4event provide the best cooling solution for events entertainment industry it could be Conference, seminar, exhibition, or other corporate or social events.AC can be installed in German hanger and Gazebo, any hall, or wedding venues. It can adjust the temperature as per atmosphere. Please discuss venue size before hiring because venue size calculation is very important before installation. This is a cheaper option for cooling in outdoor and indoor events too. Easy to install, less rental instead of AC mist fans are best for lawn, and food and beverages area. Commercial air coolers are a good option for outdoor or indoor events with less electricity consumption than AC. Likewise the cooler has less rental comparatively ac. You may hire it from any tent house at any location.